Thomas Piketty Capital in the Twenty-First Century: Surprisingly entertaining. A software engineer reads Piketty’s Capital in the Twenty-First Century. 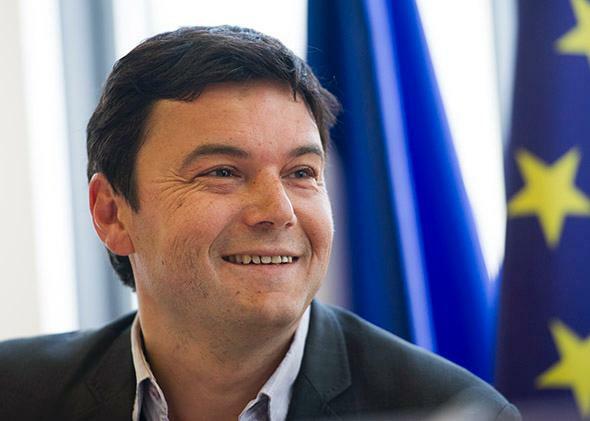 French economist Thomas Piketty on March 13, 2013, in Paris. Thomas Piketty’s Capital in the Twenty-First Century is going to be the hottest beach read of the summer. Currently residing at No. 1 on Amazon and crushing Flash Boys and A Game of Thrones, the French economist’s magnum opus on wealth, capital, inequality, and politics has garnered much praise across the political spectrum. As a software engineer trained to trust nothing and verify everything, I can give no greater compliment to Piketty’s book than that it is backed by actual evidence, and mountains of it. To this end, Piketty attacks not only right-wing but also left-wing economics; he repeatedly takes on Marx’s theoretical biases with the same fervor he goes after Milton Friedman. Much of the classic work of economists, from Adam Smith to Karl Marx to Gary Becker to (God help me) Ayn Rand, is unsupported theoretical supposition, and while such work is often useful in conceptualizing problems and interpreting results, you’d have to be quite credulous to take any of them as gospel. Piketty doesn’t. Piketty is merciless toward many of his predecessors, and his withering sarcasm, superbly translated by Arthur Goldhammer, is enormously entertaining even before you reach his dialectical comparison between House and Damages as the present-day extension of the economics of Jane Austen’s characters. One of Piketty’s fundamental complaints about economics is that it uses data in a blinkered and narrow way, shunting figures into esoteric mathematical models that overgeneralize them and generate “laws” that are nothing of the sort. One of Piketty’s favorite piñatas is Nobel laureate Gary Becker, a prominent member of the Chicago economic school that also produced Milton Friedman, Robert Fogel, Robert E. Lucas—all Nobel laureates who were heavily influential in the monetarist theory that influenced Paul Volcker, Alan Greenspan, Margaret Thatcher, and Augusto Pinochet. 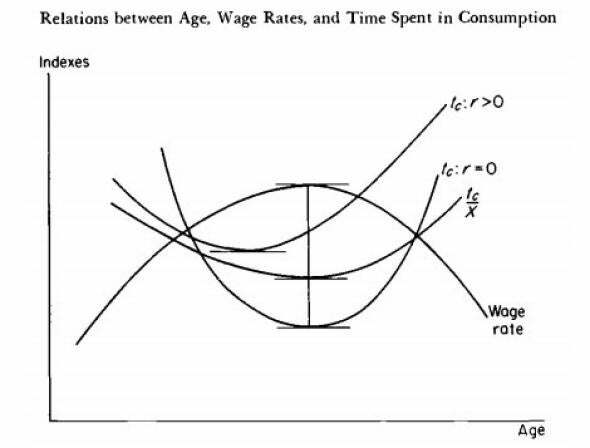 Here is Becker in 1995 arguing that the minimum wage is already too high: “Even a wizard would have a great deal of difficulty repealing the economic law that higher minimum wages reduce employment. Since politicians are not wizards, they should not try.” Becker may think that such an “economic law” exists, but here are seven Nobel laureates who disagree with him, so this clearly isn’t the law of gravity we’re talking about. Piketty goes after Becker’s unjustifiably optimistic theory of “human capital,” in which increased education and talent in people supposedly makes up for unequal distribution of nonhuman capital, yielding a capitalist utopia meritocracy. Economics: Now with less data! This graph purports to show that trained workers (T) make more money than untrained workers (U). 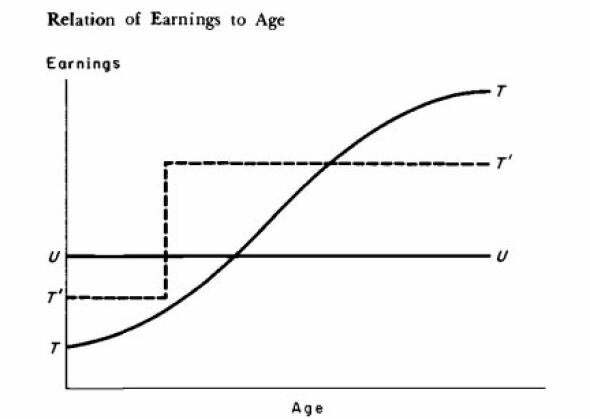 You’ll notice the absence of numbers; that’s because Becker did not use data in constructing this graph, but simply hypothesized that trained workers (like philosophy Ph.D.s) automatically get paid better than untrained workers (like Bill Gates). Nobel prize! Capitalism isn’t perfect? Tell it to the graph! Any programmer who tried to sell me on the performance of a piece of code with charts like these would get thrown out of my office. Perhaps Piketty is shooting fish in a barrel, but they’re fish that have had unprecedented influence over our barrel’s economic policy for the last 50 years. 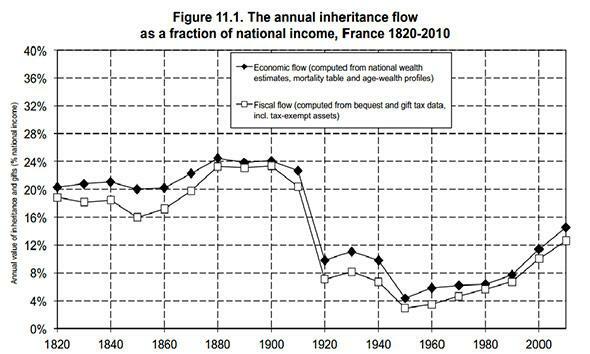 Piketty shows at great length that the wealth of the vast majority has stagnated despite the supposed increase in their “human capital.” He starts by taking a huge step back and looking as far in the past as he can—at least to 1870, often to 1800, and sometimes further. And through some fairly simple analysis, he comes up with a startling claim: that the golden years of post-war growth from 1945 to 1975 were not good grounds on which to establish economic generalizations. Instead, they were highly atypical. The rampaging inequality and flatlining of middle-class income in subsequent decades are not aberrations, but more the norm. The post-war years were not good because capitalism was magically working; they were good because 30 years of global crisis had literally destroyed a great deal of wealth, which was then quickly regenerated to give the appearance of capitalist utopia. My God, it’s full of data! Piketty doesn’t have to be totally right for the book to be damning; he just needs to generate enough reasonable doubt to embarrass Becker and his kin. This he does. Scientists frequently cringe at the abuse to which the social sciences put mathematics. I know I do, so I find Piketty’s pleas for humility and perspective compelling. Free-market fundamentalists have predictably reacted to Piketty with fear and outrage, complaining about Piketty’s “class warfare.” The Wall Street Journal’s Daniel Shuchman warns Piketty to read George Orwell and is outraged to catch Piketty praising the “Soviet experiment.” Shuchman quotes a passage in which Piketty is being sarcastic, in fact trouncing the “human disasters” of Soviet central planning. Ignoring the evidence seems to be par for the course for free-market ideologues.